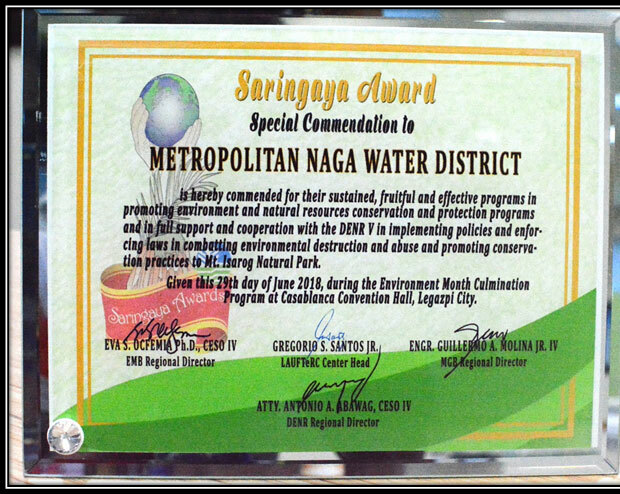 The Metropolitan Naga Water District (MNWD) received the Saringaya Award, a special commendation from the Department of Environment and Natural Resources (DENR) V on June 29, 2018, during the Environment Month Culmination Program at Casablanca Convention Hall, Legazpi City. Present at the awarding ceremonies who received the prestigious award for MNWD were Chairman Jorge T. Palma and Vicente Aniceto D. Rubio, ADMA-EWRD. Known as the highest regional environment recognition, the Saringaya Award recognizes outstanding personalities, organizations, agencies, and companies whose contribution to the environment have influenced the people and their communities to save and protect our natural resources. “Saringaya” is an old Bicol term which means abundance of growth, lush, and healthy environment teeming with green trees and mountains ideal for biodiversity and well-balanced ecosystem. The Saringaya Special Award is a validation of the MNWD’s efforts in promoting the conservation and protection of the environment and natural resources especially of the Mt. Isarog Natural Park (MINP). AWARDING CEREMONY. 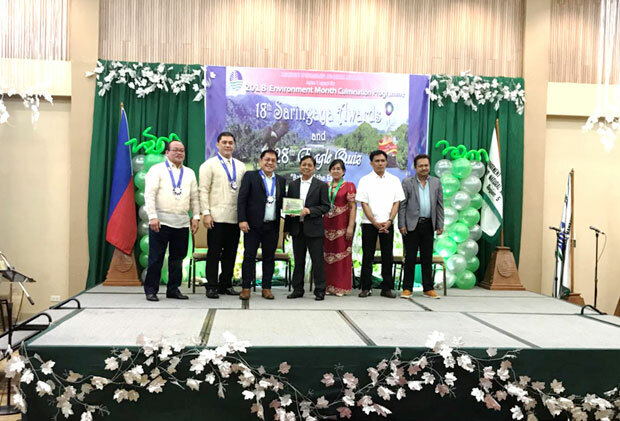 Dubbed as the highest environment regional award by the DENR, the Saringaya Special Award was received by Chairman Jorge T. Palma (3rd from right) and Vicente Aniceto D. Rubio (center) during the Environment Month Culmination Program at Casablanca Convention Hall, Legazpi City.